"This is especially good on a cold winter night along with hot rolls." Remove about one cup of the cooked potatoes and mash in a bowl with the back of a fork. Add some of the liquid from the pan (about a tablespoon at a time) along with the flour till you have a thick paste. Add this back to the pot. Place the cheese (either whole of cubed) in the pot. Let the soup simmer until the cheese melts and is thick. Add ground black pepper to taste and stir in the milk. Just made it for the first time. Added chicken stock and garlic. Also simmered it with ham bone. Still found it bland. I own a restaurant and tried this soup as a lunch special, it was a huge hit, I did add some chicken soup broth. EXCELLENT! 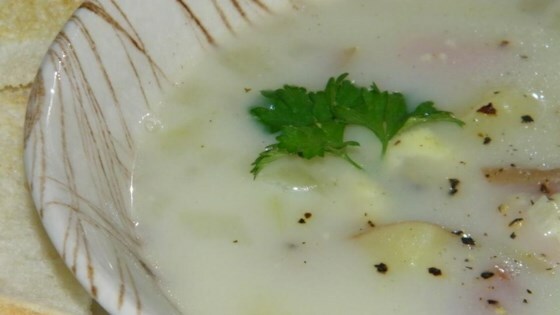 The best potato soup I have EVER had! I did however,only use one onion and half the amount of cheese,but it turned out PERFECT!